Chondromalacia is a condition wherein the cartilage on the back of the patella (knee cap) is irritated and painful because it rubs against the medial femoral condyle. Patients complain of pain felt under the kneecap on the medial side of the knee particularly while going up or down stairs and hills. Also pain and stiffness after prolonged sitting. 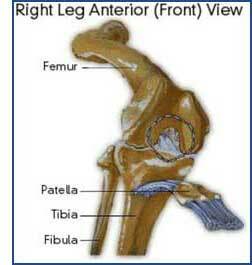 During a normal gait cycle, the femur and the tibia rotate in unison (i.e. internally during pronation and externally during supination). However, Chondromalacia occurs when a person over-pronates because the tibia is locked into the Talus and therefore continues to rotate internally past the end of the contact phase (where supination starts at the beginning of midstance in a normal gait) while the femur receives its orders from the brain and begins to rotate externally at midstance. The resulting counter-rotation of the femur and the tibia causes the patella to rub against the medial femoral condyle instead of moving smoothly up and down in its normal track, which causes the pain felt by the patient and the damage to the cartilage. Since the problem is caused by over-pronation, the patient should be fitted with orthotics and will likely experience pain relief within weeks and complete recovery within months (generally 2 – 3 months).